I also had to watch this movie in high school, but I watched it a few more times outside the classroom because I liked it so much. It confused me at first since I had no idea what was going on but once you figured out John Nash had schizophrenia, the loose ends started tying together. I am completely intrigued by your topic choice, but I have a few questions regarding the conclusion of your research. 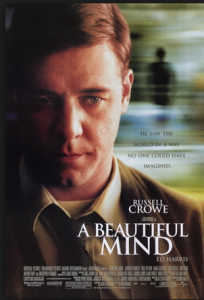 Since “A Beautiful Mind” is based on a true story, I am unsure of how the website could say that the movie got something wrong. John Nash was a true talented mathematician who suffered from schizophrenia. 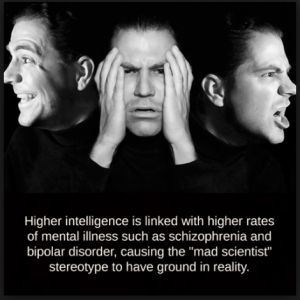 Perhaps the movie is hinting that a general finding is that schizophrenia is more of a risk for lower IQ people, and Nash happens to be an outlier. Or maybe when you say “risk,” you are regarding the effects or strength of the mental illness. For example, when Nash was working hard on a problem, you may be saying the movie should have actually depicted it as him having no symptoms of the disorder during those scenes, due to his high mental activity. Besides from that, though, I agree with you that with cases besides “A Beautiful Mind,” it is not safe to assume that all geniuses have schizophrenia. This is especially so since there is some evidence that low IQs create a larger risk. If you want to know a little more about the real John Nash’s life, it’s easily researchable. I added a link sadly regarding his recent death, which also discusses the inspiration of his wife and his history. I loved this movie as I watched it in my 12th grade Psychology class, we were studying mental disorders and the class thought it was a great piece to watch so we could understand symptoms and day to day struggles like you mentioned in your blog. 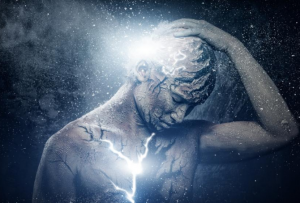 While I do agree with your statement that we should not assume that the freakish equates to brilliant, I think it is important to show this side of a disease that many people look at as just seeing things and hearing voices.Here’s an article not only explaining the disease but also how little the public actually knows about it, http://www.antipsychiatry.org/schizoph.htm I think A Beautiful Mind did an amazing job showing a more human side to a disease that is not very well known while also pushing the important idea that these people suffering from diseases like this are sill people.